Before I offer links to the patterns and tutorials you’ll need to make the halter, saddle, and the outfit shown here, let me remind you that it’s the last day to sign up to win Emily Teapot’s free Breyer® horse blankets. The contest says “four” blankets, but there are actually five being given away–all to one winner. Click here for contest rules and details, and to sign up to win them. Tomorrow Emily and I will get together for the drawing (for the free horse blankets). I’ll post the winner right here, on ChellyWood.com, on Monday, so watch for that! If you’re searching for a different pattern than those found here, have a look at the Gallery Page. That’s the easiest way to search through all of my patterns to find what you want. Each image on the Gallery Page takes you to a page like this one with links for patterns and tutorials that are designed to help you make the outfit pictured in the gallery. I have a series of tutorials for the beginning sewists on my YouTube channel. 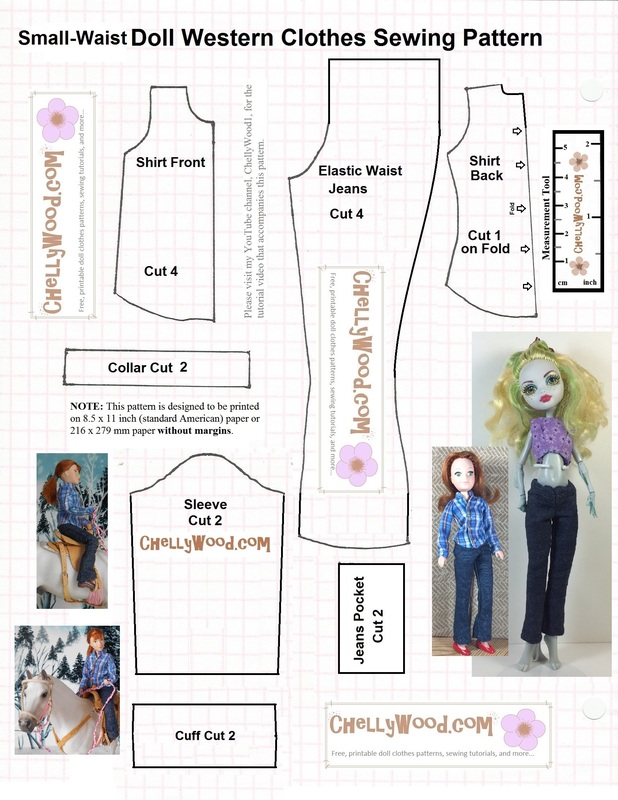 It includes video tutorials showing you how to do a basic straight stitch when sewing by hand, how to gather fabric, how to use the whipstitch to hem a garment, how to sew on snaps, and even how to design your own doll clothes patterns, if you’re curious about that. Need help printing my patterns? This link will take you to a tutorial showing you how to download my free, printable patterns. It’s important to enlarge my patterns to fit a full-sized piece of American computer paper (8.5 x 11 inches or 216 x 279 mm) without margins, before printing. In case you haven’t heard, I’ve designed commercial patterns for Lammily LLC. They have some new dolls in their line, including a new male doll, so you might want to visit the Lammily website to see what they’ve got going on. The horse blankets look beautiful and very well made! I would be very happy to win these for my granddaughters. Thanks for your comment, Wilma. They are lovely blankets in my humble opinion.